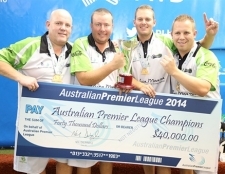 Team Henselite UK player Alex Marshall MBE and his Murray Steamers teammates have defied the odds and secured a momentous victory at the Australia Premier League, relegating the Adelaide Endurance to a consecutive runner-up finish. "I've enjoyed every single minute of this," Marshall said after the event. "I've never played in an atmosphere like this before, and I've thoroughly enjoyed it". "Back home they would not believe what happened. I'll certainly by taking DVDs back to show them".